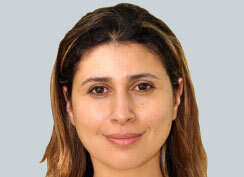 Marwa studied medicine at the Royal Free and University College Hospitals during which time she undertook an intercalated BSc in Orthopaedic Science, before attaining Membership of the Royal College of Surgeons in 2005. She trained in Radiology at St. George’s Hospital, after which she completed a Fellowship in Paediatric Imaging at Chelsea and Westminster Hospital. She was appointed as Consultant to Buckinghamshire Healthcare Trust in 2015 and now takes a lead role in Paediatric Imaging.